The post below is the chapter from the BAMS State of the climate 2013, that I author each year. Full report which is the most comprehensive assessment of climate in 2013. The World Glacier Monitoring Service (WGMS) record of mass balance and terminus behavior (WGMS, 2013) provides a global index for alpine glacier behavior. Mass balance was -638 mm in 2012, negative for the 22nd consecutive year. Preliminary data for 2013 from Austria, Canada, Nepal, New Zealand, Norway, and United States indicate it is highly likely that 2013 will be the 23rd consecutive year of negative annual balances. The loss of glacier area is leading to declining glacier runoff, since globally 370 million people live in river basins where glaciers contribute at least 10% of river discharge on a seasonal basis (Schaner et al, 2012). Figure 1: The mean annual balance reported for the 30 reference glaciers to the WGMS. 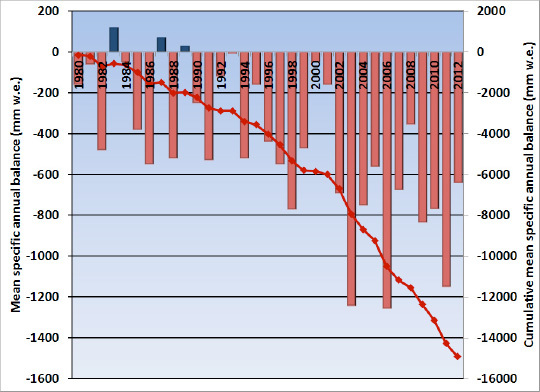 And the cumulative annual balance for the reference glaciers 1980-2012. Alpine glaciers have been studied as sensitive indicators of climate for more than a century, most commonly focusing on changes in terminus position and mass balance. The worldwide retreat of mountain glaciers is one of the clearest signals of ongoing climate change (Haeberli et al, 2000). The retreat is a reflection of strongly negative mass balances over the last 30 years (WGMS, 2013). Glacier mass balance is the difference between accumulation and ablation. The cumulative mass balance loss since 1980 is 14.9 m w.e. the equivalent of cutting a 16.5 m thick slice off the top of the average glacier (Figure 1). The trend is remarkably consistent from region to region (WGMS, 2011). WGMS mass balance results based on 30 reference glaciers with 30 years of record is not appreciably different, -15.1 m w.e. The decadal mean annual mass balance was -198 mm in the 1980’s, -382 mm in the 1990’s, and –740 mm for 2000’s. The declining mass balance trend during a period of retreat indicates alpine glaciers are not approaching equilibrium and retreat will continue to be the dominant terminus response. The recent rapid retreat and prolonged negative balances has led to some glaciers disappearing and others fragmenting (Figure 2)(Pelto, 2010; Carturan et al; 2013). In 2013 The Austrian Glacier inventory in examined 96 glaciers, 93 were in retreat, 1 was advancing and 2 were stationary, average terminus change was -17 m. Mass balance in 2013 was slightly negative on three glaciers with completed data. A 170 m increase in annual equilibrium line altitude on 43 glaciers in the Alps from 1984-2010, is driving the ongoing retreat (Rabatel et al, 2013). In Norway terminus fluctuation data from 33 glaciers for 2013 with ongoing assessment indicate, 26 retreating, 4 stable and 3 advancing. The average terminus change was -12.5 m (Elverhoi, 2013). Mass balance surveys with completed results are available for six glaciers, all have negative mass balances with an average loss exceeding 1 m w.e. (Andreassen, 2013). In the North Cascades, Washington the 2013 winter accumulation season featured 93% of mean snowpack (1984-2013). The melt season was exceptional with the mean June-September temperature tied with the highest for the 1989-2013 period and had the highest average minimum daily temperatures. The result was significant negative balances on all ten glaciers observed, with an average of -1 m w.e. (Pelto, 2013). In British Columbia end of summer snowlines were quite high and annual mass balance significantly negative. In Alaska all four glaciers with mass balance assessed had significant negative mass balances (Pelto, 2013). 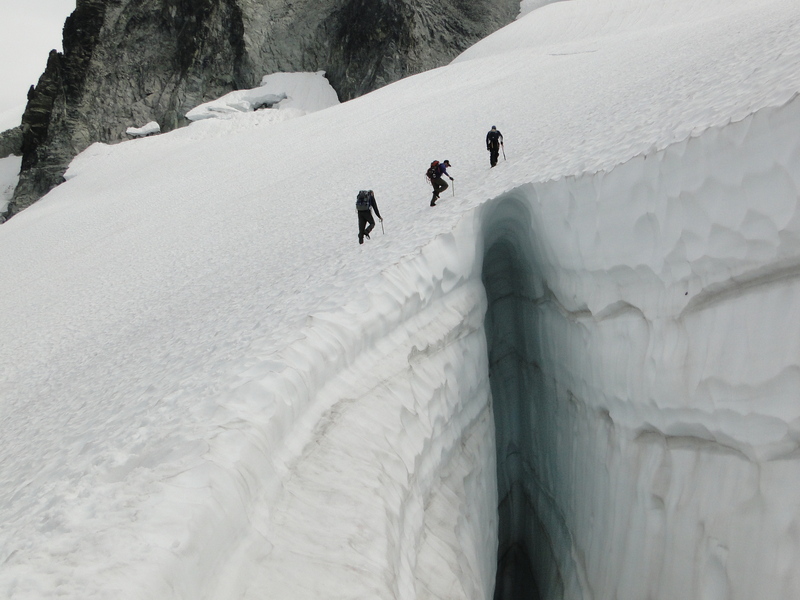 Figure 3 Assessing snow depth in crevasse Lynch Glacier, North Cascades. In New Zealand the annual end of summer snowline survey on 50 glaciers found snowlines that were slightly above the elevation for glacier equilibrium. Heavy snow accumulation during October was offset by a warm and dry summer with high ablation (NIWA, 2013). In Nepal the mass balance of Yala, Mera and Pokalde Glacier were near equilibrium. Accumulation was the highest of the last seven years, with particularly heavy snow from extratropical storm Phailin (ICIMOD, 2013). Carturan, L., Baroni, C., Becker, M., Bellin, A., Cainelli, O., Carton, A., Casarotto, C., Dalla Fontana, G., Godio, A., Martinelli, T., Salvatore, M. C., and Seppi, R. 2013: Decay of a long-term monitored glacier: Careser Glacier (Ortles-Cevedale, European Alps). The Cryosphere, 7, 1819-1838, doi:10.5194/tc-7-1819-2013. Elverhoi, H., 2013: Norwegian water resources and energy directorate 2013 glacier length change Table.http://www.nve.no/Global/Vann%20og%20vassdrag/Hydrologi/Bre/Nedlastinger/Length_Change_Table_2000-2013.pdf?epslanguage=en. Haeberli, W., J. Cihlar and R. Barry 2000: Glacier monitoring within the Global Climate Observing System. Ann. Glaciol, 31, 241-246. Pelto, M. 2010: Forecasting temperate alpine glacier survival from accumulation zone observations. The Cryosphere,4, 67–75. 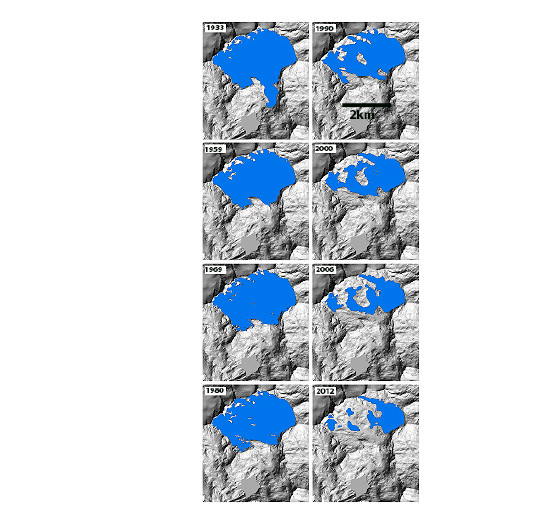 Rabatel, A., Letréguilly, A., Dedieu, J.-P., and Eckert, N.: Changes in glacier equilibrium-line altitude in the western Alps from 1984 to 2010: evaluation by remote sensing and modeling of the morpho-topographic and climate controls, The Cryosphere, 7, 1455-1471, doi:10.5194/tc-7-1455-2013, 2013. Schaner, N., Voisin, N., Nijssen, B. and Lettenmaier, D. 2012: The Contribution of Glacier Melt to Streamflow. Environmental Research Letters 7 (doi:10.1088/1748-9326/7/3/034029. WGMS, 2013: Glacier Mass Balance Bulletin No. 12 (2010–2011). Zemp, M., Nussbaumer, S. U., GärtnerRoer, I., Hoelzle, M., Paul, F., and Haeberli, W. (eds. ), ICSU(WDS)/IUGG(IACS)/UNEP/UNESCO-WMO, World Glacier Monitoring Service, Zurich, Switzerland. This entry was posted in Glacier Observations and tagged alpine glacier disappearing, alpine glacier mass balance, alpine glacier melt, bams glacier, global glacier losses. Bookmark the permalink.